Every child will have unique needs in a crisis and will express how and when you can meet those needs. Much will depend on how closely a child is affected, whether she knows anyone who was personally involved, or how much she's been exposed to the news, as well as her age, developmental level, and individual temperament. Let your children give you clues about how to meet their separate needs, and don't assume that one size fits all. When America was attacked on 9/11, my twin daughters had just celebrated their sixth birthdays. After rushing home to be with my family, I suggested that each girl could have some private daddy time because I assumed they would need extra comfort. I walked one daughter around the block, and we settled on a park bench. She asked many questions about the planes and the reasons why something like that could happen. I answered as best I could, although I was totally rattled and confused myself. Then she pulled out some paper and pencils she'd brought along, began drawing intense pictures, and explained them to me. Drawing and talking really helped her work it out, and I felt that I had learned how to navigate this impossible task. When we arrived back home, I suggested to my other daughter that we also take a walk. "Great," she said, "let's get a pizza." Incidentally, the pizza daughter is one of the most intense humans I know. She had exactly the same exposure to events as her sister but didn't want to discuss anything. She just wanted normalcy, the security of feeling that life was going on. 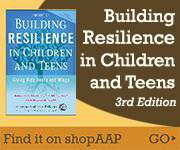 How children respond to traumatic events depends on their developmental level. Feelings of anxiety, sadness, confusion, and fear are all normal reactions, and with parental love and support, most children will bounce back after a period of adjustment. It is typical for a child's emotional response to trauma to last a few weeks. There may be cause for concern if a child has overly intense emotional reactions, if feelings last for a long time, or if her responses get in the way of her ability to get through the day (e.g., unable to go to school, trouble eating, difficulty sleeping).